We started having trouble with the y-axis encoder. When the encoder is toggled to on in the web app, and you tell the FarmBot to move to a position, it will move 3 or 4 times in very, very small amounts, virtually going no where, and then stops moving. Once I turn the encoder off, it starts acting normal again. Has anybody had this problem or anything similar to this? Did you try to invert the encoder with the toggle in the hardware settings as Gabriel posted in the other thread you replied? 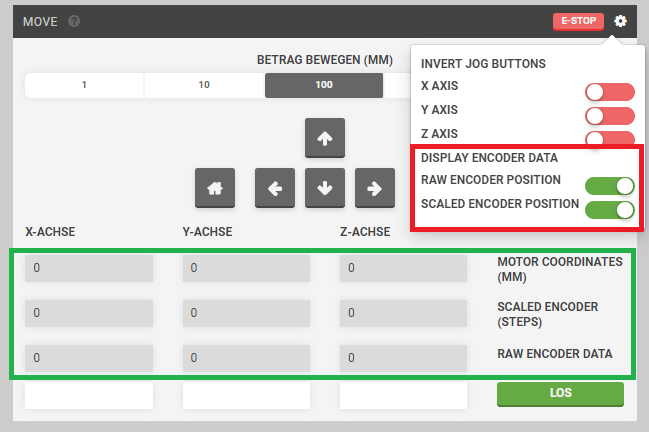 Move the Y-axis by hand for like 100mm and check what the encoder’s output is, as you can see in the green box of the picture (SCALED ENCODER). Post a screenshot of this box if this does not fix your issue already.